McDonald's as we all know is a place for burgers. So my curiosity got piqued when I saw them selling Hot Dogs for breakfast here in the capital. I saw the picture taken outside the store (See Above) and I was sold. 5 minutes and RMB 10.00 (SGD 2.00) later, I got this (See Below). 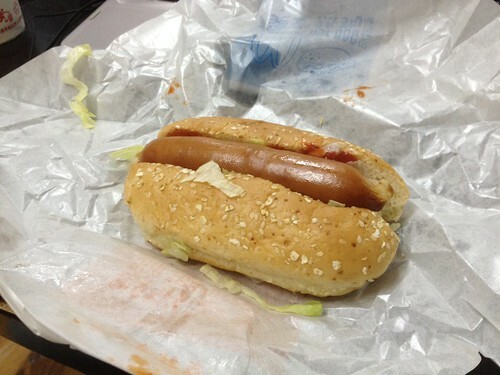 First of all, the hot dog bun is too small for the sausage. When I tried to clamp the sausage, the bottom of the bun split wide open and everything just fell to pieces. So much for holding the bread so as not to dirty your hands. Overall the taste is MEH. Not going to eat it again. naeboo: Let me guess. You were thinking it should have been the symbol for the Japanese Yen? Well, if I am not wrong, Yen is the kanji equivalent to the Chinese Yuan. Hence, the symbol of a "Y" as in Yen and Yuan, with two strokes across ala the dollar where it's an "S" with two strokes across.